Chocolate lasagna is a one-of-a-kind recipe. 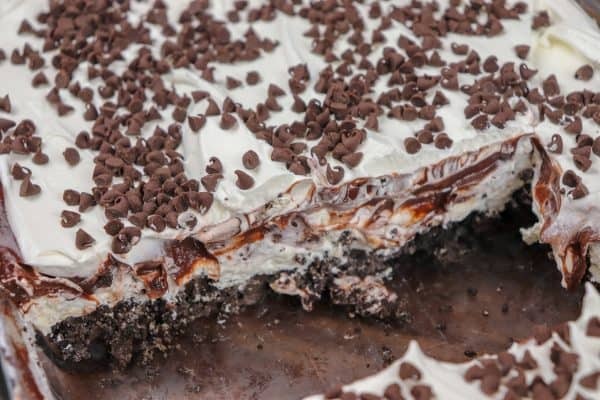 It’s made with instant chocolate pudding, Cool Whip, an Oreo and butter crust, and plenty of mini chocolate chips to top it off. 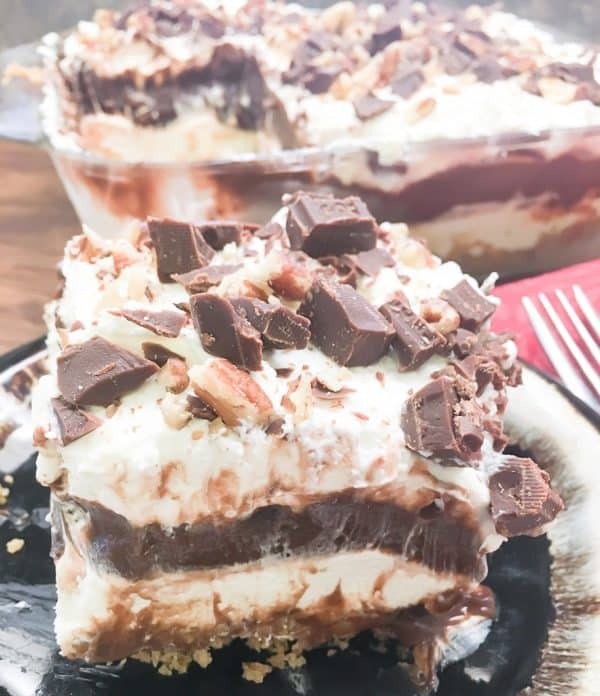 The layered chocolate lasagna recipe is easy to make and everyone will fall in love with the no-bake dessert. I don’t think I can brag about this dessert enough because it is unquestionably one of the best out there. The chocolate pudding dessert balanced against crushed Oreo cookies, Cool Whip, cream cheese, and mini chocolate chips is a game changer. 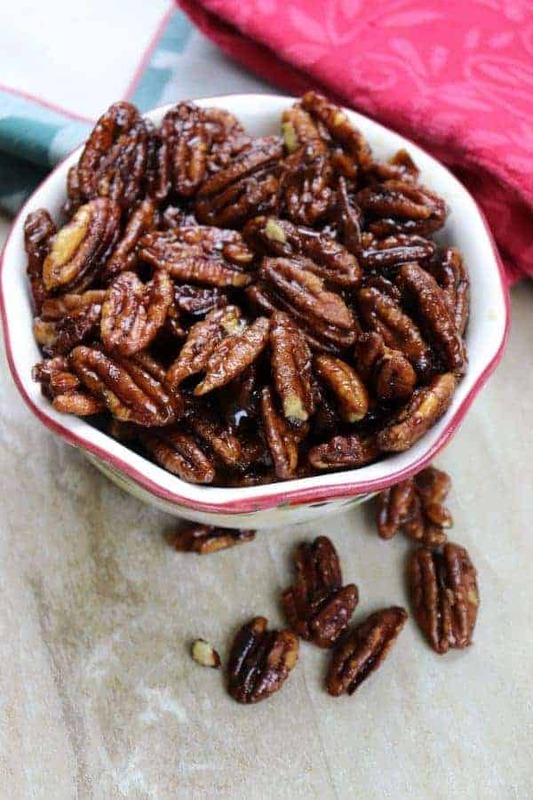 Take this easy dessert recipe to a church potluck, the front office at the kid’s school, or an office party, and you’re going to be the star. 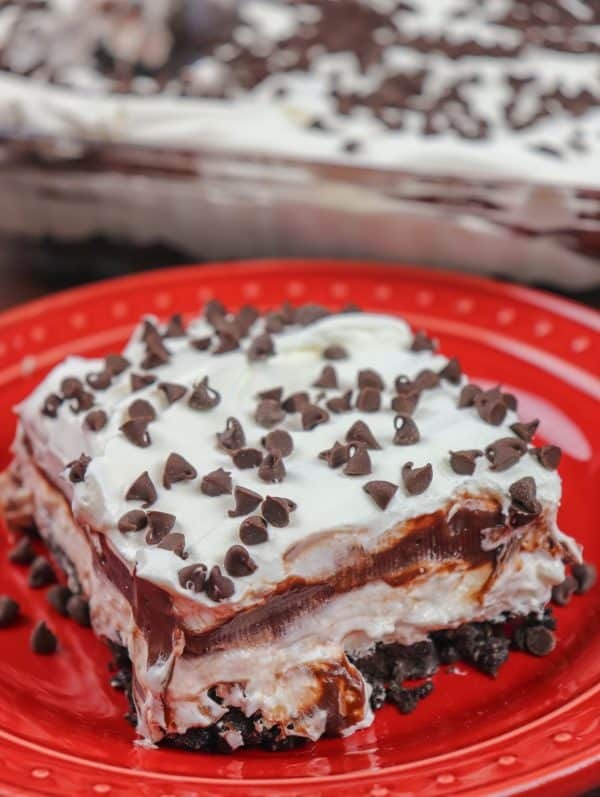 We’re not going to even talk about chocolate lasagna calories, because this is so worth breaking every rule to get a piece. Trust me on this one. It’s rich, creamy, and full of goodness. 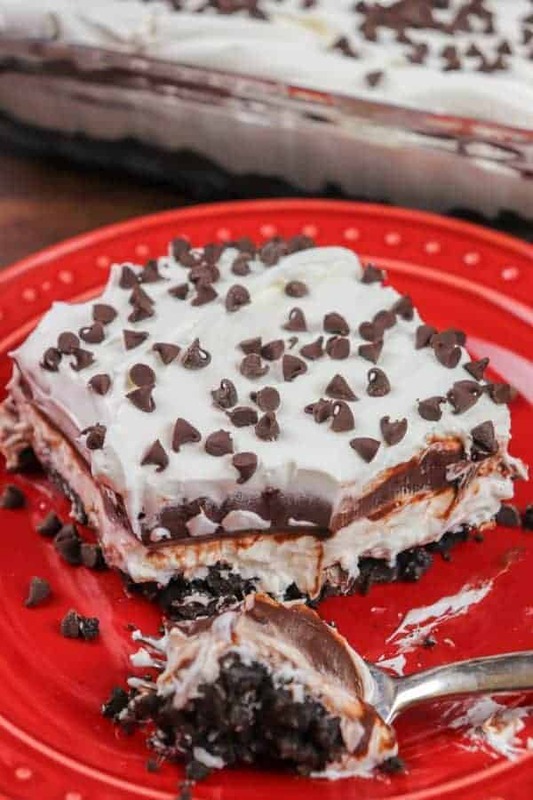 How do you make chocolate lasagna? Crush the Oreo cookies in a Ziplock or with a Cuisinart. Add to a bowl and add melted butter. 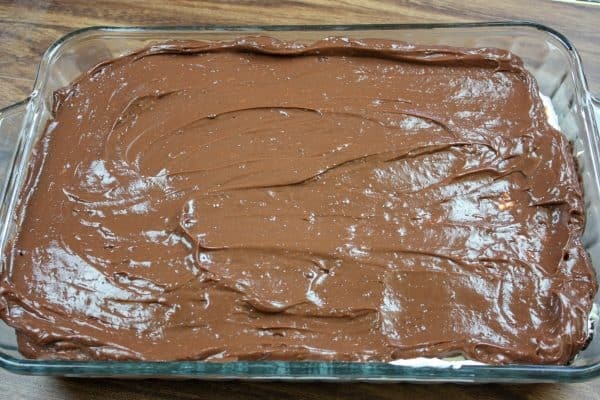 Press into a 13″ X 9″ baking dish. Next, mix the cream cheese, milk, and sugar. After combined, fold in Cool Whip. 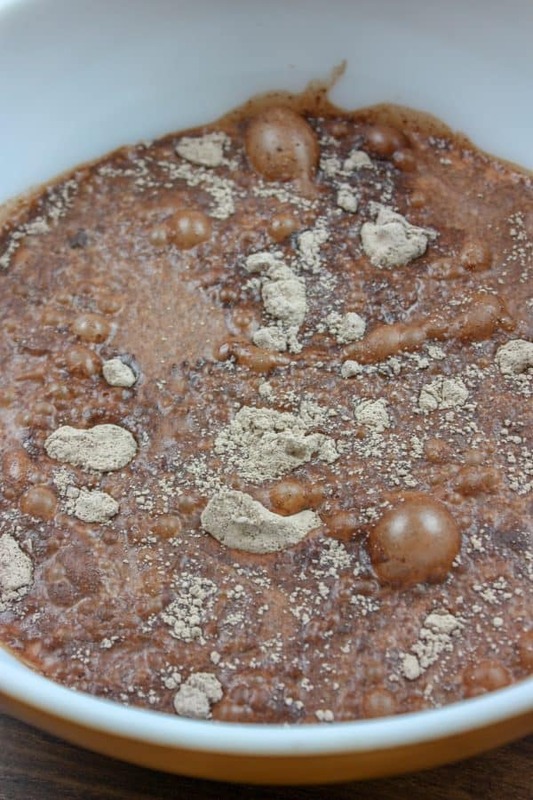 In another bowl, combine milk and instant pudding. Mix until thick. 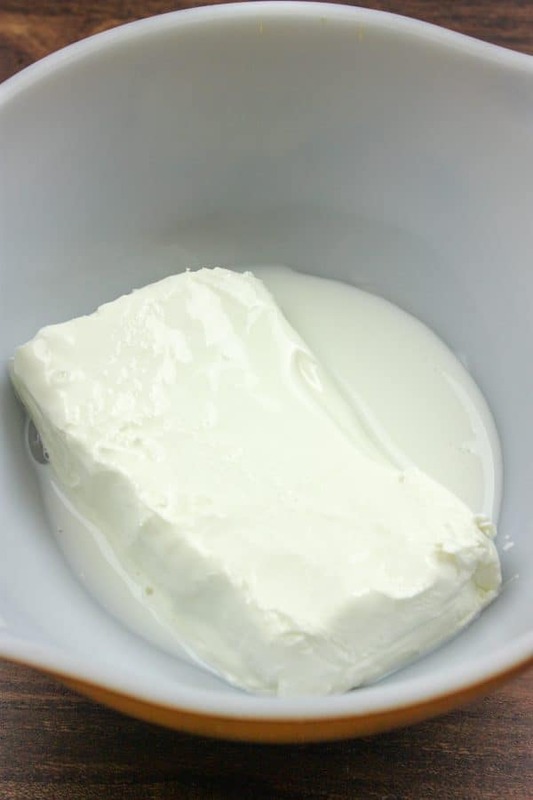 Pour over cream cheese mixture. Top with the remainder of the Cool Whip and mini chocolate chips. Freeze for one hour or cool for four hours. 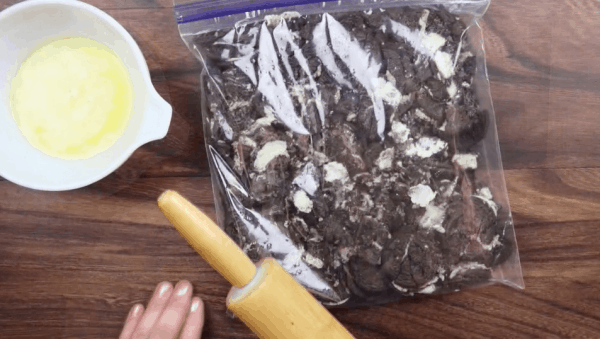 Start by melting the butter in a bowl and place the Oreos in a baggie and crush them up. 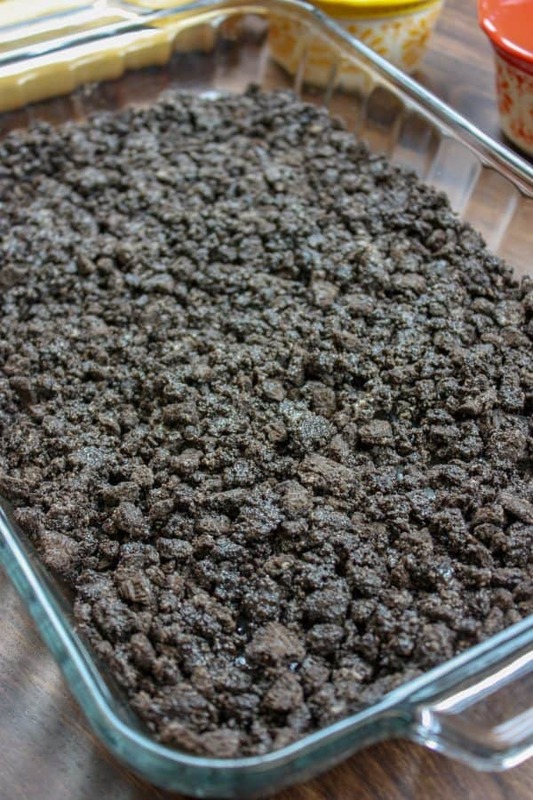 You’ll be using regular Oreos for this recipe because the double stuff will have too much of the cream center (I never thought I’d make that statement). 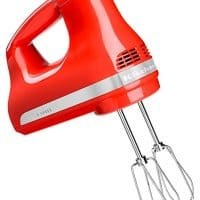 If you have a Cuisinart you can use that to chop up the cookies. It will make a more consistent crumb crust, but if you don’t it’s also fine to break the Oreo cookies in a bag. I broke the cookies up in a bag and they had a few larger pieces, but it still tasted fantastic. You can do so many things with Oreos, from cookies to cakes to frosting. Next, add the Oreo cookie crumbles to a bowl and pour the butter into the bowl. Mix everything together so the cookies are covered. 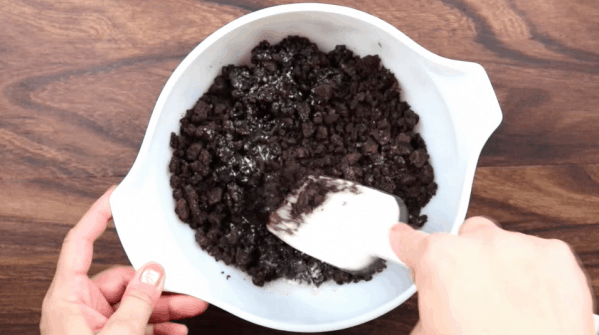 Press the Oreo chocolate and butter mixture into the bottom of a 13″ x 9″ casserole dish. You don’t need to grease it before adding it to the dish. It won’t stick. You can see in this picture that the crumbles are bigger. Grab a medium-sized bowl and add 8 oz. 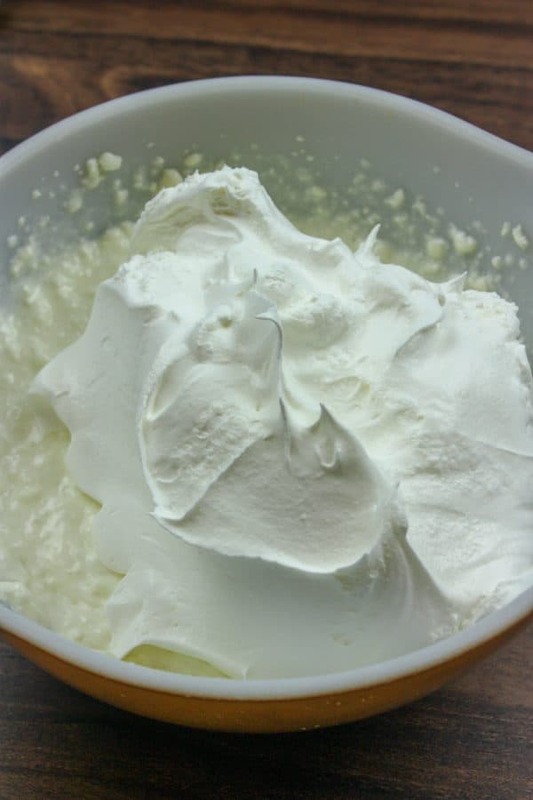 of softened cream cheese to the bowl. Pour some of the milk into the bowl. 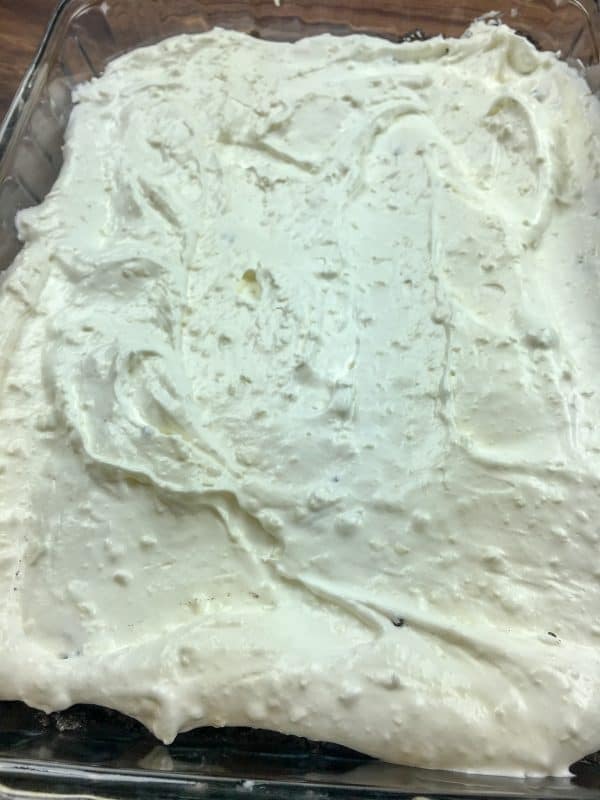 If you didn’t set your cream cheese on the counter to soften, the milk will help soften it a bit when you start to mix it. Add the sugar to the bowl. Mix everything together. It’s going to be a little lumpy and that’s ok because once you add the Cool Whip and layer the dessert it won’t be lumpy. 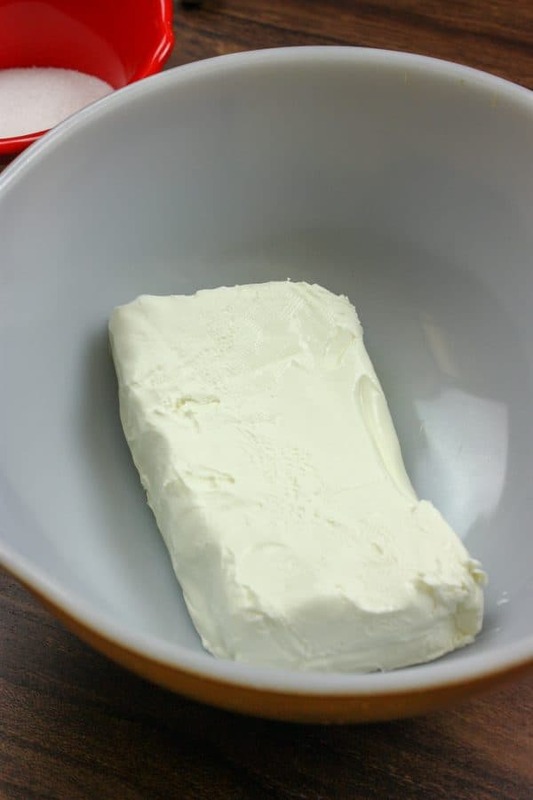 Add half of the Cool Whip to the bowl and fold everything together. The Cool Whip is going to add a light and fluffy texture to this layer. You can buy a large 16 oz. container of Cool Whip at the store and split it in half. Spread the cream cheese and Cool Whip layer out over the cookie crumb base. Mmm… getting excited! Place it in the fridge to firm up some while you work on the next layer of the chocolate lasagna. Rinse out your bowl, or grab another one and add the Jell-O Instant Pudding. Whoever came up with instant pudding is a genius. It’s so easy to make and tastes great. Five minutes and the pudding is done. Ok, moving on. Add the remainder of the milk to the bowl and mix it until it thickens. There are several Jell-O Instant Pudding box sizes and for this recipe and I used two 3.9 oz. boxes. Once the pudding thickens, in about two to five minutes, spread it over the cream cheese mixture. Doesn’t it look so divine? 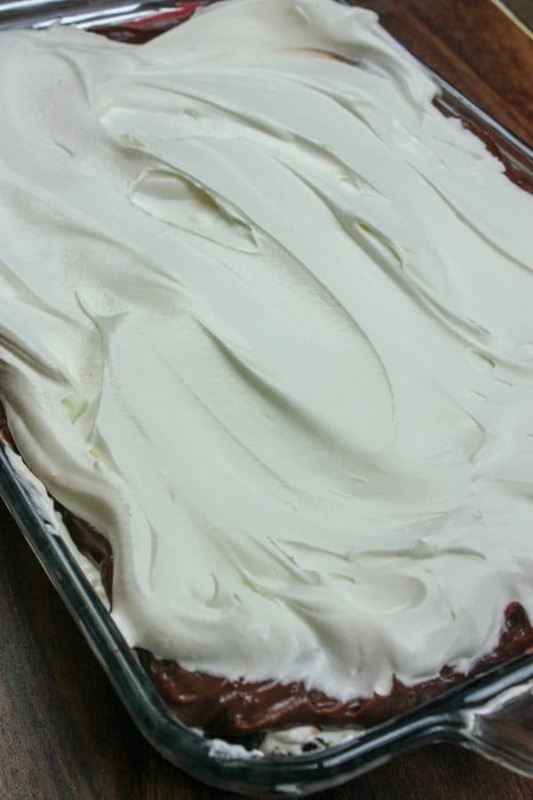 Finally, spread the remainder of the Cool Whip on top of the layered dessert. 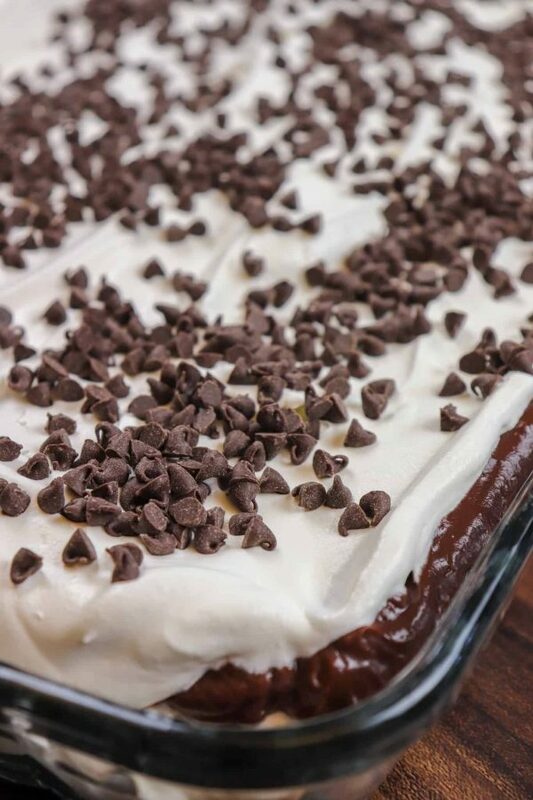 Sprinkle the mini chocolate chips on top and place the Chocolate Lasagna recipe back into the fridge for four hours before serving so it will firm up. 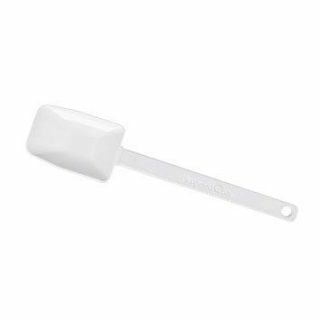 If you need it sooner than that place it in the freezer for one hour and it will be firm enough to serve. Look at those layers in this dessert. Creamy, chocolatey, amazing. The combination of crunchy and creamy is what sets it apart. When I made this the other day, I had to share some of it because I knew I would end up eating the entire pan. It’s that good! Chocolate lasagna is a one-of-a-kind recipe. 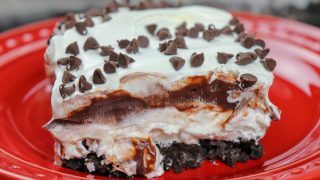 It's made with instant chocolate pudding, Cool Whip, an Oreo and butter crust, and plenty of mini chocolate chips to top it off. The layered chocolate lasagna recipe is easy to make and everyone will fall in love with the no-bake dessert. Crush the Oreos in a bag or in the Cuisinart. Add the Oreos to a bowl and pour in the melted butter. Stir. Press into an ungreased 13" x 9" casserole dish and set aside. 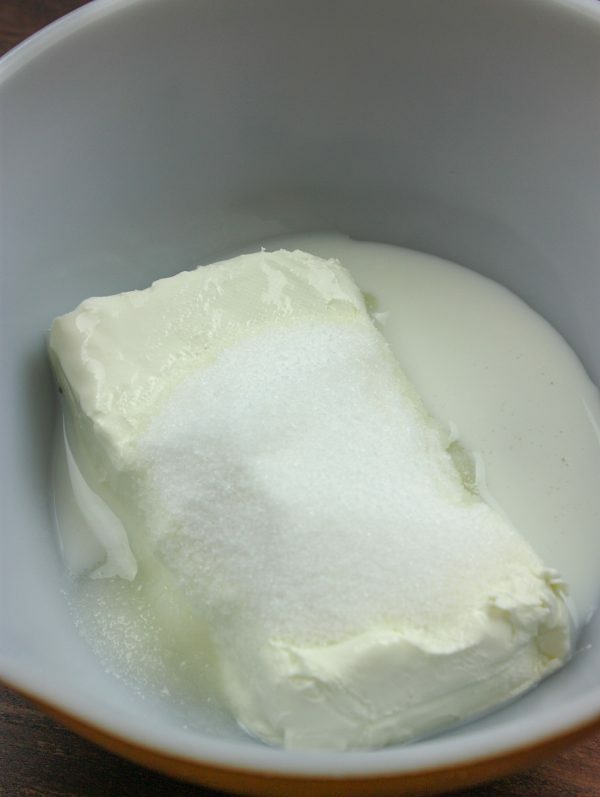 Add the cream cheese, 2 tablespoons of milk, and sugar to a medium-sized bowl. Mix together. Add 8 oz. of the Cool Whip to the bowl and fold until well blended. Spread over the Oreo crust. Place in the fridge while preparing the next step. Add the two packages of Jell-O Instant Pudding to a bowl. Pour in 3 1/2 cups of milk and stir until thickened. About 2-5 minutes. Spread the remainder of the Cool Whip on top of the dessert. Sprinkle mini chocolate chips on top. Cool in the fridge for four hours or in the freezer for one hour to firm up the dessert.